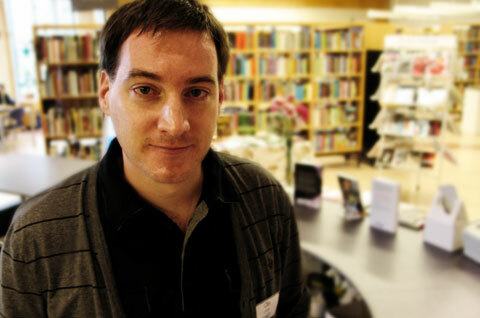 We are delighted to welcome Ola Kumlin from Emmaboda Library in Sweden to TheCrimeHouse. 1. What criminal novels are the most popular? The most popular criminal novel during 2009 was probably The Hypnotist by Lars Kepler. And of course the Millennium trilogy by Stieg Larsson. 2. Which criminal novel(s) would you recommend? I actually don’t read that many criminal novels, but when I do, it’s mostly the kind where the focus is on environmental and societal descriptions instead of “who did it.” A Swedish author in that genre is Kristian Lundberg, who is working on a series that take place in Malmö, Sweden. He has written four novels so far, which I really recommend. Criminal novels are popular year-round. But we can definitely tell when authors have been mentioned in the news or via word of mouth. I have also noticed that novels that are said to be based on a true story are popular right now. 4. How do you decide which books/novels to purchase for the library? We make a lot of our purchase decisions based on demand, and our visitors often make purchase suggestions. We go through the Swedish bookstore’s catalog a couple of times a year and make purchases. Good reviews can also result in purchases. Then we have book meetings every other week where we decide what books to purchase in a variety of subjects. We try to keep a broad offering, where both popular and narrower fields are available. Everyone should be able to find something. 5. What is your opinion about audio books and e-book readers? Do you think they will replace “regular” books? I don’t think they will replace printed books, but rather be another way to absorb stories. It’s good that there are different media for different situations. Thanks to audio books many people who normally don’t read have found a way to appreciate literature. Truck drivers suddenly became a growing group of borrowers at the libraries when the audio books came. In my opinion the media isn’t what’s important, but rather the content and that is the same regardless whether it’s in printed or digital format. But to be honest, I don’t think I will buy an e-book reader. 6. Do you think libraries will change because of the digital book development? And if so, how? Libraries have already changed a lot since the digital development started. We have had digital services for a long time; you can search for books online, you can download e-books (even though it’s not until now that good devices for reading them have started to appear), you can download music and search for scholarships using our digital services. This will most likely increase in the future with less focus on book handling. That’s what I think. But I am convinced that there won’t be a lack of tasks, since the librarian’s guiding function will remain. 7. In addition to lending books, what other activities and services does the library offer? We have many digital services, as mentioned above. We help students of all ages search for information and order textbooks. We also have something called The Book Arrives, i.e. if you have difficulties coming to us, we will bring books to your house. We also have media and computers that are accommodated for people with disabilities. We have a lot of activities for children, e.g. story times and meetings where parents can bring their babies and get tips on how to stimulate children’s language development. There is plenty of genealogy material, which is much appreciated and often requested. You can also use a computer, read the newspaper, make copies, and send faxes, etc. at the library. We have a book club once a month. We want the library to a living place with plenty of activities, so we plan something for every Wednesday. Last night we had a lecture about Stig Dagerman’s authorship and next week there will be a knitting café, where you can learn how to knit socks with a heel! We offer plenty of things. 8. How did you decide to become a librarian? I have studied literature and wanted to work with literature in one way or another, but I didn’t want to teach. So I chose to become a librarian, even though the job involves much more than promoting and discussing literature. 9. What is the most fun with your job? I run a book club once a month. That’s the most fun; to discuss literature with other people. It’s also rewarding to help people find something they are looking for. 10. What books do you prefer do read? I am picky but can usually read most genres, as long as it is well written. The best reading experience I have had in recent years is The Road by Cormac McCarthy, which was made into a movie recently. That novel blew me away, it was amazing. 11.	Who do you suggest we interview next at TheCrimeHouse? And what question would you ask that person? I’m not quite sure, but maybe a publisher? 12. Anything else you would like to share with TheCrimeHouse readers? No, I don’t think so. But I appreciate the opportunity to participate. A big thank you to Ola Kumlin.